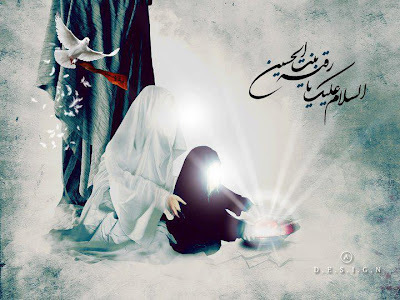 Bibi Sakina (s.a.) was the youngest daughter of Imam Husain (a.s.). She was a vivacious child, full of love and happiness. Everyone loved Sakina (s.a.). She was also a very religious girl. She enjoyed reading the Holy Quraan and never missed her prayers. From the age of two she took great care to make sure that her head and face were properly covered when in public. 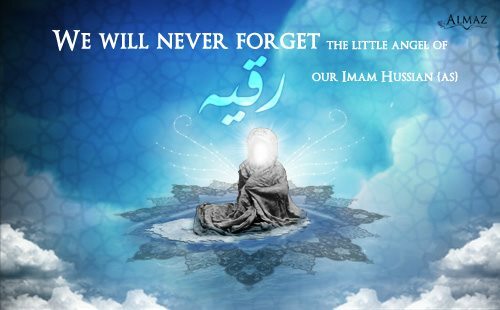 Sakina (s.a.) was Imam Husain (a.s.)'s most beloved child. Our Imam was often heard to say, “A house without Sakina (s.a.) would not be worth living in!” She always had a sweet and cheerful smile and a very friendly nature. Other children sought her company as much as the grown ups did. She was very generous and always shared whatever she had with others. There was a special bond between Hazrat Abbas and Sakina (s.a.). He loved her more than he did his own children. If Sakina (s.a.) requested for anything, Abbas would not rest until he satisfied her request. There was nothing that Abbas would not do to make Sakina (s.a.) happy. During the journey from Madina to Mecca and then Mecca to Karbala’, Abbas was often seen riding up to the mehmil in which Sakina (s.a.) sat to make sure that she had everything she wanted. Sakina (s.a.) loved her uncle just as much. While in Madina she would, several times a day, visit the house in which Hazrat Abbas lived with his family and his mother, Ummul Baneen. Like any other four-five year old when Sakina (s.a.) went to bed at night she wanted to spend some time with her father. Imam Husain (a.s.) would tell her stories of the prophets and of the battles fought by her grand-father Ali. She would rest her head on her father's chest and Husain (a.s.) would not move from her until she fell asleep. When from the second of Muharram the armies of Yazid began to gather at Karbala’, Husain (a.s.) said to his sister Zainab (s.a.), “The time has come for you to get Sakina (s.a.) used to going to sleep without my being there!” Sakina (s.a.) would follow her father at night and Husain (a.s.) had to gently take her to Zainab (s.a.) or Rubaab. At Karbala’ when from the seventh Muharram water became scarce Sakina (s.a.) shared whatever little water she had with other children. When soon there was no water at all, the thirsty children would look at Sakina (s.a.) hopefully, and because she could not help them she would have tears in her eyes. Sakina (s.a.)'s lips were parched with thirst. On the Ashura day, she gave her Mashk to Hazrat Abbas. He went to get water for her. The children gathered round Sakina (s.a.) with their little cups, knowing that as soon as Hazrat Abbas brought any water, Sakina (s.a.) would first make sure that they had some before taking any herself. When Sakina (s.a.) saw Imam Husain (a.s.) bringing the blood drenched 'alam she knew that her uncle Abbas had been killed. From that day on Sakina (s.a.) never complained of thirst. Imam e Zamana (atfs) in Ziarat e Nahiya; "Peace be upon the lips. that were parched due to thirst." "Salaam Ho Murjhaye Hue Honto'n par"
Then came the time when the earth shook and Sakina (s.a.) became an orphan! Sakina (s.a.) never again asked anyone for water. Bibi Zainab (s.a.) would persuade her to take a few sips, but she herself would never ask for water or complain of thirst. Shimr (l.a.) untied her with the warning that if she did not return soon he would flog Imaam Zain ul ‘Abideen (a.s.) to death. Bibi Zainab (s.a.) ran in the direction from which they had travelled. Some distance away she saw an elderly lady holding Sakina (s.a.) affectionately, kissing her cheeks and wiping away her tears. She could hear Sakina (s.a.) telling the lady how her uncle Abbas had gone to fetch her water and how he had never returned. When Sakina (s.a.) saw her aunt she explained that she had fallen off the camel but the kind lady had looked after her. Bibi Zainab (s.a.) turned to the lady and said, “May Allah reward you for your kindness to this orphan!” The lady replied, “Zainab (s.a.), my dear, how can you thank your own mother? Do you not recognize me?” As the lady lifted her face, Bibi Zainab (s.a.) saw that it was Fatimah Zahra! Salam on you, who is buried far from home. Salam on you, who never made it out of that desolate dungeon. Salam on you, young Hashemite Princess (A.S). congratulation on the birthday savior mankind ,imam mahdi. i will be happy if u come to my bloge.